Meet A Mother Like No Other. Bruce the Bear likes to keep to himself. But when his hard-boiled goose eggs turn out to be real, live goslings, he starts to lose his appetite. And even worse, the goslings are convinced he’s their mother. What’s a bear to do? 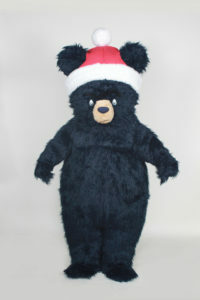 The wearer of the Bruce the Bear Costume should be 5’6″ to 5’10” and of average build. The rental fee for the Bruce the Bear costume has been graciously provided by the publisher Disney Publishing Worldwide for promotional use only at schools, libraries, bookstores, and literacy programs. The only cost to you is Second-Day Air shipping arranged by Costume Specialists to send the costume to its next event which is only $160.00.